MBOX File Viewer Software open Thunderbird MBOX File data files instantly. 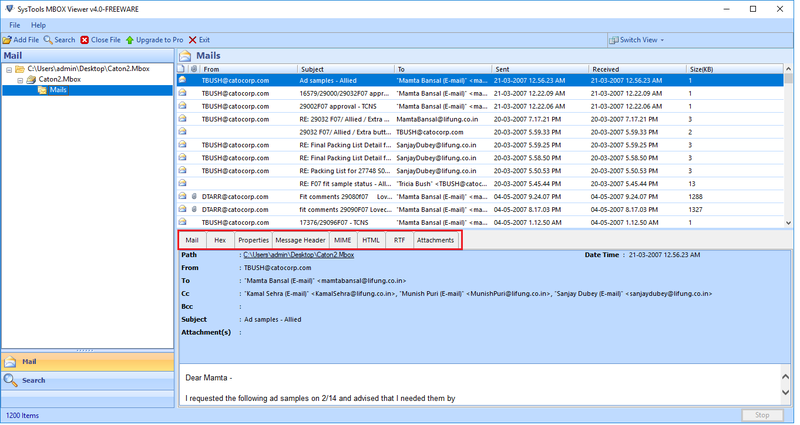 Email clients store information such as address, contacts and e- mail messages in MBOX file format. Free Thunderbird MBOX Fille viewer software helps you to extract contents from damaged, corrupt, password protected or inaccessible MBOX files. It is a very light weight, portable and utilizes minimum resource, but provides the desired output. Built with a user friendly interface this software is easy to use, highly customizable and is the best office MBOX file viewer. It also provides easy options to preview attachments of any format with built in file previewer. Supports all the platforms of Windows .MBOX mail viewer maintains the original format of the message and displays the content without making any changes. It provides options to search for keywords within MBOX files to ease out locating files with specific content. No need to install other mail clients for viewing recovered MBOX files it even extracts information such as addresses, calendar data, journals , notes etc .